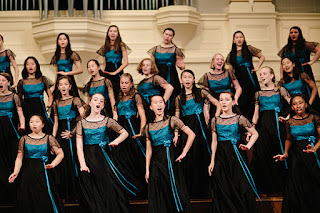 I am writing today to tell you about a new recording project by the amazing Susan McMane and her outstanding choral organization, Young Women’s Choral Projects of San Francisco. About to celebrate their fifth season, the choir will work in studio this summer at the state-of-the-art Skywalker Sound in California with a topnotch recording engineer. The result will be a new recording of many excellent compositions, including by living composers and will be out in the fall. The repertoire is mostly Christmas music, so the October release date is well-chosen. I first met Susan at an ACDA conference year ago. I was struck by her artistic standards and unfailing energy. 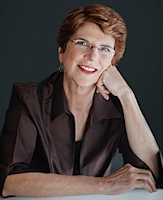 Over the years Susan has been awarded three Grammy awards and traveled the world to share her choral excellence and vision with choirs of all ages. 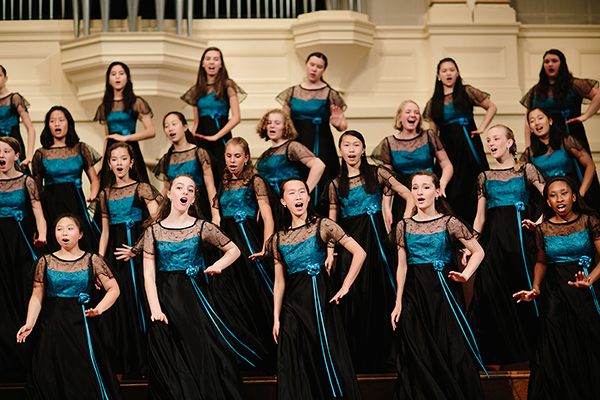 After many years leading youth choirs in San Francisco she decided to create this new group, a more elite ensemble of amazing young women—thus the group is not a children’s choir. The idea of projects allows Susan and the ensemble to plan and produce more than just your average concert. In fact, the ensemble has specialized in creating programs about the empowering aspects of music and has done a number of very interesting collaborations with other choirs as well as with well-known singers such as Moira Smiley. If I lived in San Fran I would be at every event they create! To help produce their first recording there is an Indiegogo page you can visit. Click here! The rewards for donations to the project are pretty awesome. Susan has already chosen most of the repertoire for the recording and it will feature pieces commissioned by the choir from Frank La Rocca (a much underappreciated west coast composer- he deserves far more national attention) as well as by Eric Barnum of Minnesota. In addition, there will be pieces by other topnotch living composers such as Eleanor Daley, Alice Parker, David Conte, and others. Acknowledged choral masterpieces by Victoria, Biebl (not Bieber), Benjamin Britten, and others will round out the recording. Susan has shared recent recordings of some of the pieces which will go through the process of professional recording this summer. I have to say that what I have already heard is spectacular! Please keep an eye on this project by visiting the Indiegogo page and I will update this blog with more news as the recording session happens. For anyone who appreciates finely-sung choral music, and especially, meaningful music for sparkling women’s voices, this project is exciting news. On October 21st at Aurora University Dr. Lisa Fredenburgh will conduct an excerpt (Mashed Potato Love Poem) from my three movement set Play With Your Food, written about twelve years ago. It's one of my most popular pieces and here are the program notes I usually provide. This set of three pieces is my most performed work. It's not too surprising, since I found three great, truly clever texts to set. May Swenson gives us a cornucopia of delicious summer treats, with the compound words all split apart and reconnected backwards; blueberries become “berries of blue”, Brazil nuts become “nuts of Brazil” and so on. My favorites are “rooms of mush” and “puppies of hush”! You might hear a bit of the music from the overture to “Porgy and Bess” toward the end, by the way. The text for “Mashed Potato Love Poem” is by Sidney Hoddes, a very cool guy who is now an elderly doctor still practicing in Liverpool--but wayback he was a friend of the Beatles and caroused with them in Liverpool before they became famous. The final movement, “Vending Machine”, about a hungry young lad and his happy to play-along Dad, has some lively musical hints of Bernsteins' overture to Candide popping up. Yes, I do like to parody or borrow from other composers or write in their general style now and then! One of my favorite memories from when I led the choral program at the North Carolina Governor's School was surprising the cafeteria staff with a mini-concert each summer with this song featured. We would make the staff stop working and sing to them. You should have seen all the smiles! Here's a nice performance of the piece (with a bonus track of Vending Machine and an interesting touch they added to that tune) by Oran, a wonderful Canadian youth choir which is part of the Kokopelli Choir organization. The Metea High School Treble Singers, directed by Nathan Bramstedt, will perform my arrangement of the African-American spiritual A City Called Heaven on October 21st at Aurora University (Aurora, IL). I'm excited that I will get to hear them perform this piece, since Metea has a history of musical excellence, including placing highly in the annual Grammy music awards for high schools across the country. This is one of the most poignantly sad, yet beautiful spirituals I know, and a piece I had been wanting to arrange for quite some time, especially after listening to an old recording by the amazing Marion Anderson. See way down below for more on Marion Anderson and her role in the civil rights movement in America. The imagery of the title is what has always attracted me, yet it stands in such stark contrast to much of the text, which speaks of spiritual isolation (…“my father’s still walkin’ in sin. My brothers and sisters won’t own me…”). This music tells of an unfortunate period of our American history, yet also tells the universal story of the human will to survive. I’m also beginning to think we should call these songs what they really are, and what St. Olaf College esteemed conductor Anton Armstrong calls them, that is, slave songs. By doing so, we are forced to face the history behind them, and not just sing them mindlessly. I had decided to create an arrange of this piece, yet a germinal idea for an arrangement just hadn’t quite hit me, so I kept tabling the project repeatedly over three years or so. Finally during a stretch in December 2005 when I was working on some other spirituals for SATB (mixed choir) I sat down with this piece again and began to try a few things at the piano, and the piece finally started to take shape. Up until then, I just hadn't found a way to make my arrangement more than just ordinary, and that's a problem! The challenge in creating an artistic arrangement is to find a way to create something unique--something with a new twist that people may be surprised by. It could be taking a piece in 4/4 (common time) and turning the beat into 7/8 or some other mixed meter, or it might be changing the usual speed of a piece. For me, the unique aspect that finally popped up was creating a really powerful, loud setting of the section where the words are "sometimes I'm tossed and driven..." and adding in a strangely dissonant chord into the piano part. This section is a giant, dramatic contrast to the quiet beginning and end of the piece. Further note: In general I think our new arrangements of spirituals should be a cappella, as that takes us closest to the origin of the music. Yet, I think there is some room for some accompanied spirituals as well. I'm toss'd in dis wide world alone. I've started to make Heaven my home. some-times I don't know where to go. I've started to make it my home. my father's still walkin' in sin. be-cause I'm a-tryin' to get in. 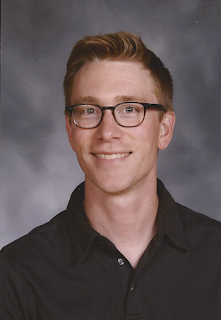 Mr. Nathan Bramstedt has been a member of the District 204 music faculty for 12 years. At Metea Valley High School, he leads a choral program of 250 singers and teaches Bass Chorus, Concert Choir, Treble Singers, Chamber Singers and Music Theory. After school he directs Off the Record vocal jazz ensemble and Girls Group and sponsors the student-led a cappella groups Apollo and the Muses. Mr. Bramstedt also assists with the marching band. Behind the scenes, he is the Theater Program Director, where he produces the main stage productions and directs the musicals. Prior to opening Metea Valley in 2009, Mr. Bramstedt taught choral music at Crone Middle School. His choirs have shared stages with area orchestras, collegiate choirs and community ensembles. He has been recognized five times by the Indian Prairie Educational Foundation as a "Most Influential Educator." He earned a Master of Music in Choral Conducting degree from the Pennsylvania State University. Before his Fellowship assignment at Penn State, he taught high school choir and band in Warrensburg, IL. He earned a Bachelor of Music Education degree from Illinois Wesleyan University. He has performed with the Cavaliers Drum and Bugle Corps, the Chicago Master Singers and has directed choir tours across the country and Europe. On October 21st, at the Aurora University Choral Festival featuring my works, the Aurora University Chamber Choir, directed by Dr. Lisa Fredenburgh, will perform the final movement of my piece God's Nature. This piece was actually commissioned a couple years ago by another conductor who will be performing at the Oct. 21st concert, Paul Laprade. Paul had asked me to write a celebratory work to commemorate the union of two historic churches in Rockford, where he lives. The two churches were the Second Congregational UCC and the First Presbyterian Church--combined now they are often referred to as Second/First Church. The entire piece, God's Nature, has a title with a dual meaning. It refers to God and his Creation, the earth we live on--it also refers to the nature of God's love for humankind. How do we know of his love, how can we sense God's purpose? God Be in My Head: Our perception of God, and how God is within us. A bit of an introductory movement. The voices and strings mostly work together. The piano is a bit in another world, but eventually joins into the ensemble more. The goal was to achieve a slightly surreal setting and some mystery as the piece launches- get people to listen- draw them in. For the Beauty of the Earth: Nature's beauty- a lyrical movement in a John Rutter sort of style- and actually a reworking of a setting (never premiered) I did in 2005 which I think I have really improved on by adding the string instruments and added writing quality from eight more years of choral composing/creativity/voice leading and voicing experience, etc. All is pretty and happy. Lord of the Winds: A shift to doubt, worry, fear of abandonment- set up by the powerfully dissonant instrumental intro. A short, yet powerful text by Mary Coleridge, the great-grand niece of Samuel Taylor Coleridge. Click to read this fine text. Shall we Gather at the River/Jerusalem my Happy Home. Shift to the joy and peacefulness of nature, the river symbolism, and then excited hopes of arriving in heaven/Jerusalem etc. Lots of nature images in the poetry. I like the shift to hope and the simplicity of joyous pentatonic melodies plus the rather Coplandesque harmonies I place with those pentatonic lines. In joy and peace with Thee? when I thy joys shall see. Under the leadership of Lisa Fredenburgh, the Aurora University Chorale and Chamber Choir perform both on campus and away serving the AU community and communities throughout the Midwest. 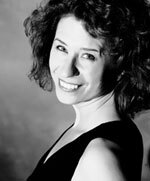 She has held previous conducting posts at University of Central Missouri, Meredith College in Raleigh, NC and with the Opera Company of North Carolina and Capitol Opera Raleigh. She holds a DMA and two MM degrees from the University of Arizona where she studied under Maurice Skones, Thomas Hilbish, Jerry McCoy and Kenneth Jennings. Her BA in music education was earned at Luther College, under Weston Noble. On October 21st at Aurora University The Rock Valley College Chamber Singers, directed by the very talented Paul Laprade, and with Valerie Blair, piano, will perform my piece Thou Art the Sky, with texts by the brilliant Indian poet Rabindranath Tagore. This group actually premiered the piece on Feb 1, 2008 at the Illinois 2008 MENC (Music Educators National Council, now called NafMe) convention. The text for this song is #67 in Gitanjali (Song Offerings) by the Indian poet Rabindranath Tagore (1861-1941). Gitanjali’s simple yet deeply profound meditations on God and Nature touched a nerve in pre-World War One Western Europe and the US. 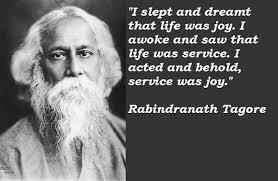 As the volume achieved whirlwind popularity Tagore became a household name in wide circles, and for Gitanjali (originally in Bengali, with an English translation he created himself) Tagore became the first Asian winner of the Nobel Prize in Literature in 1913. In my setting I have tried to musically match the simplicity and directness of Tagore’s meditation, and have also created a chant-like inner theme to the piece by returning again and again to the line “O thou beautiful”. I have also set other texts from Gitanjali, including a multi-movement work. Also, Oxford publishes my arrangement of another poem from Gitanjli, When I bring to you Colour’d Toys, composed by John Alden Carpenter and arranged by me for women’s voices and piano. "I have carried [Gitanjali]... about with me for days, reading it in railway trains, or on the top of omnibuses and in restaurants, and I have often had to close it lest some stranger would see how much it moved me. These lyrics---which are in the original, my Indian friends tell me, full of subtlety of rhythm, of untranslatable delicacies of colour, of metrical invention---display in their thought a world I have dreamed of all my live long. The work of a supreme culture, they yet appear as much the growth of the common soil as the grass and the rushes. A tradition, where poetry and religion are the same thing, has passed through the centuries, gathering from learned and unlearned metaphor and emotion, and carried back again to the multitude. [Tagore expresses]...an innocence, a simplicity that one does not find elsewhere in literature makes the birds and the leaves seem as near to him as they are near to children, and the changes of the seasons great events as before our thoughts had arisen between them and us." Btw, the Illinois ACDA (American Choral Directors Association) chose Thou Art the Sky as the winner of its 2007 Choral Composition Contest. 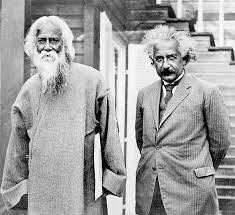 Tagore and Einstein, 1930, STYLIN'! Paul Laprade, conductor, is Full Professor of Music and Director of Choral Activities at Rock Valley College where he conducts the Concert Choir, Chamber Singers, Women’s Choir, teaches courses in music theory, choral conducting, vocal (lyric) diction, music education, and voice, and assists in advising the collegiate MENC chapter. Ensembles under his direction have performed throughout North America, and have performed at the White House for Presidents Clinton (1994), Bush (2001), and Obama (2010). His articles and review appear in several journals, including The Journal of Music Theory, Theoria, and The Choral Journal. 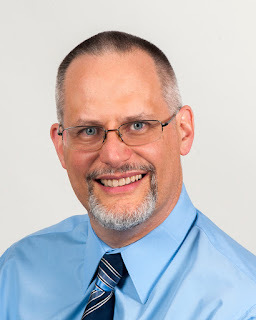 Regionally, he has presented papers on choral technique for the IL-ACDA (July 2005), PMEA (2003), IMEA (2006 and 2008), and conducted at ACDA Division and National conventions. Nationally, he has presented papers on the music of Boulez for the Society for Music Theory (Oakland, CA), and on the music of Donald Martino for the national meeting of the American Musicological Association (Baltimore, Maryland). An active adjudicator and clinician throughout the eastern United States, Laprade frequently appears as a guest conductor for county, regional, and symphonic choruses. His pedagogical interests focus heavily on the relationships between music perception, movement, and choral rehearsal processes. His research interests emphasize score analysis and rehearsal technique. 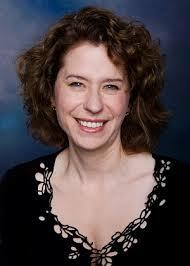 Laprade was given the Excellence in Teaching award from the Eastman School of Music. A graduate of Rhode Island College, Eastman School of Music, and Westminster Choir College, with advanced degrees in Music Education, Music Performance, Music Theory, and Choral Conducting, Laprade studied choral conducting under Joseph Flummerfelt, James Jordan, Allen Crowell, Donald Neuen, and in workshops with Robert Shaw. Laprade resides in Rockford, Illinois with the lights of his life, his sons Nathaniel and Jonathan; his time and activities with them are the proudest part of his life. This Sparkle of the Day will receive its world premiere on October 21st at the Aurora University Festival Concert which holds music written by me over the last fifteen years. Although the piece was written in 2005, it has yet to have a full premiere of all five movements until now. Many thanks to Dr. Peter Dennee of Carthage College (Kenosha, WI) and the newly formed select ensemble Candentibus Women's Chamber Choir which will be performing this work. 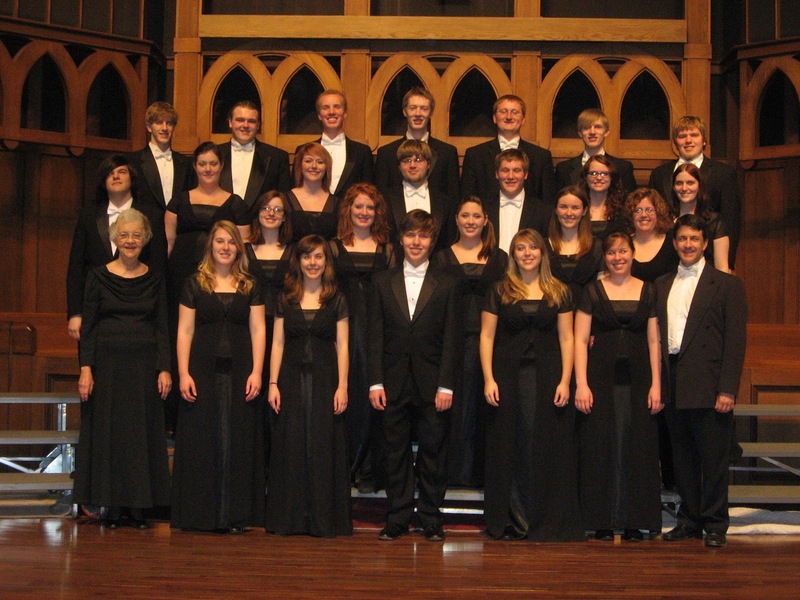 In February 2016 a larger ensemble from Carthage College will perform excerpts from the piece at the American Choral Director's Association North Central Division Conference held in Sioux Falls, South Dakota. Additionally, the choir will sing the piece in its entirety at a church while they are in the Sioux Falls area. For this piece I utilized some delightfully refreshing texts by early Catholic saints. I devised short movements that can stand alone or work together in sequence, basically a progression of worship from night into the morning offices. Yet these pieces can be used outside of strictly Catholic services, since the texts simply encompass somewhat general Christian images and ideas. The general musical model for the piece's structure and overall feel was the Gabriel Faure Messe Basse, a gentle little ten minute gem which is a basically utilitarian worship piece of understated beauty. Thus the simple, manuals only organ part (pedals may be added ad libitum), and the fairly easy SSA vocal parts. Another model, more so for the melodic shapes and harmonies, comes from the British composer Benjamin Britten. Movement two has some interesting features--the first section is an originally composed setting of the Latin text O Nata Lux de Lumine, which then proceeds to the English version as set by the Renaissance English composer Thomas Tallis, quoted almost verbatim. This is another example of something which I do now and then, quote (or parody, or "sample") other composers' works or snippets of old melodies. In the Tallis section there is a strange little moment when voices disagree on pitch, some parts are singing in a major key while other parts are in minor. This is an effect Tallis (and a few other composers of his time) was quite known for. The text of movement four is short yet profund. It speaks of how quickly a human life can come into existence and go. We're only here for an instant--It's up to us to make every moment count in some meaningful way. the night is gone, the day is near. new light upon the heaven is spread. and offer all their wants aright. and cause us to be like to Thee. and Holy Ghost, Thou comfort best! Now and until all time shall end. of that Thy Holy body pure. if you did not rain upon us. Our souls can taste and rejoice in. Professor Peter Dennee ’86 joined Carthage in 2005. He conducts the Carthage Women’s Ensemble and teaches courses in conducting and music education. 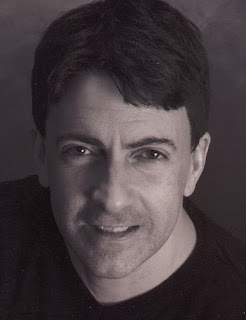 Prior to his appointment at Carthage, Prof. Dennee held positions as assistant professor of music at West Virginia University and Susquehanna University, and visiting assistant professorships at the University of Colorado-Boulder and the University of Michigan. He has taught music at the elementary and secondary levels in Baltimore, Milwaukee, and Tempe, Ariz. 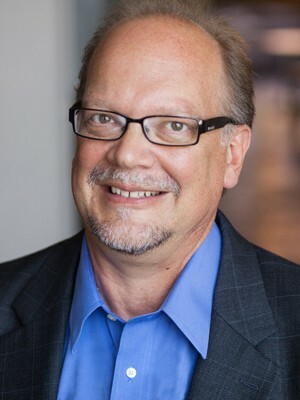 He earned a Doctor of Musical Arts in choral music from Arizona State University, a Master of Music in music education from the Peabody Conservatory of Music at Johns Hopkins University, and a Bachelor of Arts in music education from Carthage (1986). Hey, if you've read all the way down to here-- here's your bonus! My good friend Joan Szymko set a wonderful text by St Therese of Avila titled Nada te Turba. Here is the text (Joan uses a shortened version of the full text) and the song, conducted by another pal of mine, Lynne Gackle. At the October 21st festival concert at Aurora University in Aurora, IL a number of fine ensembles will be singing selections from my choral output over the last fifteen years. I am currently blogging about each piece that is on the program, giving readers some insight into how and why I produced these pieces. Today's post is about Alley Cat Love Song, a bluesy, jazzy setting for SSA/piano of former US poet laureate Dana Gioia's clever poem. And the scent of catnip has gone to my head . This piece was commissioned by Jim Yarbrough, the director at that time (now retired, and will be in attendance October 21st) of the fine Naperville North High School choral program, and one my earliest supporters. Since Jim has a jazz background (and he also was bass section leader under the legendary Margaret Hillis at the Chicago Symphony Orchestra Chorus!) I decided to write him something jazzy and bluesy. 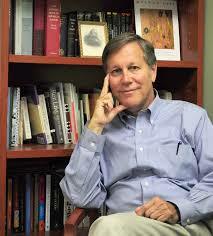 I found this wonderfully sly text by Dana Gioia and set about having some fun with it. Musically the piece goes back and forth between a lyrical, “night music” quasi- Debussy stereotypical impressionist feel (hopefully pianists will smile a bit when they notice an actual Debussy piano prelude quote in the piano intro) and the jazz/blues sections. The ending plays around with different ways of saying the boy cat’s name, “Fred”, including purring/rolling the r sound. I even had an excuse to include one of my favorite Ravel chords in this piece (a pretty pungent V chord with a flat 9 and a sharp 11). It’s a chord Ravel uses in pieces like the Piano Concerto and his other jazz influenced music. Here's Debussy Voiles, which I "borrowed" (sampled? stole? parodied?) at the beginning. When pianists first sit down at the piano with the score to Alley Cat Love Song this is a fun surprise for them. They can't help but grin at the unexpected quote from a piece they all know! Hey, if you've read all this way--here's your reward. The epic hit from last century (1961), The Alleycat by Bent Fabric (love that name!). Check out the old school image here- an old 45 RPM vinyl record! This is blogpost number two about the upcoming October 21st choral festival at Aurora University showcasing my choral music. Today I'll be discussing Loosin Yelav, the Armenian folk song which the Waubonsee Community College Choir, under Mark Lathan (see more down below) will be singing. I was asked by Mary Alice Stollak, a great conductor (now retired) from Michigan, and recipient of two Grammy awards(!) to arrange this song for her choir at that time, the amazing Michigan State University Children's Choir (the top group is usually high school girls plus some boys with uncharged voices). Mary Alice, early on in her career as a soprano soloist had performed the version of the song by Italian avant-garde 20th century composer Luciano Berio, which is part of his set of folk songs from different countries. Mary Alice felt that this lovely tune would be delightful in choral arrangement. She asked me to do it for her choir and I agreed. One of the things I tried to accomplish in my setting was to give the illusion of space--- in a sense, the expanse of space as we raise our eyes off of what is in front of us (texting on a cellphone perhaps?) and behold amazing things way up in the sky--like the Moon! One way I did this was to create a rising introduction in the solo violin part; create a rubato, floating feeling in the voices (in the slower sections); and write a piano part which would utilize the whole keyboard, including stretching all the way up to the top of the keyboard. Of course, in the more dancelike sections of the piece that expansiveness doesn't exist. There we're just having fun dancing!! This piece has proven to be quite popular with singers and audiences. It has been performed on a number of continents, including a wonderful performance directed by the famous conductor Andre Thomas at a festival in England. The piece is easily learned as the Armenian is not difficult. When I visit choirs and work on the piece we mostly have to work together to create two different worlds-- that floating in the sky rubato and then the exhilarating little folk dance that pops up. It's usually pretty easy to get young singers to have fun with this piece. Here again is the video I shared a few days ago. This was created by a parent of a young singer performing in a festival choir I was conducting in Pennsylvania. I love the amazing images of Armenia in this little video. Ready for some more fun? Along with fellow Italian modernists such as Bruno Maderna, Luigi Dallapiccola, and Luigi Nono, Luciano Berio (1925-2003) enjoyed a highly successful career as a composer in the second half of the 20th century. Here is the amazing third movement of his Sinfonia composed in 1969, featuring the Swingle Singers. This is a truly wild segment of the piece-- a bizarre musical collage thrillride through the Symphony #2 Scherzo of Mahler plus quotes from other composers: Ravel, Debussy, Brahms, and many more! If this music mystifies you, you can Wikipedia Berio Sinfonia and read a decent explanation of what's going on! Born and raised in the Chicago area, Dr. Mark Lathan received his Bachelor's degree in performance from Northern Illinois University in 1983, where he studied trumpet with Ron Modell and jazz arranging with Frank Mantooth. Earning his Ph.D. in 2001 from UCLA, Lathan studied composition with Roger Bourland, David Lefkowitz, and Ian Krouse. While at UCLA he received the Henry Mancini Award in Film Composition and studied film scoring with Jerry Goldsmith. He counts among his compositions numerous compositions and arrangements for jazz and chorus, as well as several film scores and a number of concert pieces including two choral cantatas, Inheritance of Love and Song of Hope. Lathan's various compositions have been published by C. L. Barnhouse, Doug Beach Music, Yelton Rhodes Music, and Art of Sound Publishing. He was a contributing arranger for Louis Bellson's Sacred Concerto which was released on the Percussion Power label in 2005. Two of his arrangements appear on the CD release "Above and Beyond" by the Los Angeles Flute Quartet and his Trumpet Concerto was premiered by Mark Baldin and the Rockford, IL Symphony in 2009 as part of their 75th Anniversary Season Celebration. "Echale Todas Las Ganas" ("Give It All You Got"), a commissioned composition for Wheeling High School?s Jazz Band I, was premiered at the Midwest Band and Orchestra Clinic in December 2013. Lathan is currently in his thirteenth year as Music Professor at Waubonsee Community College in Sugar Grove, IL where he directs the Waubonsee Chorale and teaches theory, composition, trumpet, and humanities. Coming up on the evening of October 21st my choral music will be celebrated in a concert by multiple high school and college choirs in Crimi Auditorium at Aurora University. For more information on this free, open to the public event visit concert details Please come and hear the fine choirs singing that evening! I am humbled by this honor-it's the first time anyone has thrown me a party and filled an entire program with just my music! Lisa Fredenburgh, the head of the music department at Aurora U, developed the idea for this event over last spring and summer and Lisa and I enjoyed getting together to discuss how to make it happen. She sent out invitations to various area choral ensembles and we were fortunate to have some great directors respond with interest (some others couldn't commit to the October date, but I hope that in the future they can do some work with Lisa in some way--she's a great musician and so enthusiastic when working with singers). The directors who will be conducting that evening are very talented, classy folks. I'm thrilled with who chose to participate! It has been interesting to me to see what pieces the directors have chosen. I didn't give them much input, as I thought it would be best to let them choose. At this point I am very happy with their choices, and in many ways they have chosen pieces that emphasize the trends in my output. For instance, I have a commitment to contribute to the legacy of the African-American spiritual and the audience that night will hear two very different spiritual arrangements. A City Called Heaven (in a rare setting for women's voices) is a mournful, desperate introspective cry for salvation, while Go Down, Moses is propelled forward by a very active piano accompaniment, eventually culminting in a great wall of choral sound toward the end. Lisa has noted my fondness for witty, droll texts. Mashed Potato Love Poem is a prime exmple, as is the tongue in cheek Alley Cat Love Song. Further humor (darker and more satiric) shows up in the exceprts from my Zombie opera, Blood, Guts, and Arias. Finally, a number of pieces have been chosen which exemplify my search for serious texts which probe the inner spirituality of the human condition. Thou art the Sky and Life has Loveliness to Sell would be prime examples of that type of piece. Over the next week or two I am going to blog about each piece, give some background to how I composed the setting of the text and also why I chose to set it in the first place. I hope this will be of value to the singers of each choir (who, I hope, will visit the blog to read) and anyone else out there wondering what living choral composers are thinking as they compose. Well, actually, sometimes we don't know what we're doing- but we keep slogging on anyway! Here's a little teaser--this is a video put together by a parent of a student singing at a vocal festival I was conducting in Pennsylvania a few years ago. We performed Loosin Yelav and this is what they created-- some wonderful images of Armenia here! Here are some other pieces of mine, including SATB, which might really spice up your December programs. I also have a piece with a similar feel to it- my arrangement of “Gabriel's Message”, available in manuscript. Contact me at paulcarey440@yahoo.com for a perusal score.